THE previous post spoke about Microsoft’s racketeering [1, 2, 3, 4, 5, 6, 7] against Android [1, 2]. This is an aggressive action, it is not an interaction, no matter how Microsoft employees try to paint that. Microsoft has gotten all sorts of witty ways of imposing software patents upon GNU/Linux. One way to get around Samba’s deal (patent concessions) in Europe appears to be a group of former Microsoft staff (called Likewise [1, 2, 3, 4]) which is bringing such patent fees into the latest Ubuntu GNU/Linux (or Kubuntu, the latest version of which I am trying at the moment, alongside PCLinuxOS 2010). But this isn’t the main subject of this post. So, the deal with HTC isn’t the only partnership Microsoft entered into today. The Joomla! project has announced that Microsoft has signed the Joomla! Contributor Agreement, meaning the Redmond company is now a contributor to this GPL project. Microsoft code has already found its way into the upcoming Joomla! 1.6 release, and closer cooperation between Joomla! and Microsoft will follow. The news was announced by Open Source Matters, Inc., the not-for-profit organisation behind Joomla!. The fruits of the closer cooperation between them are already finding their way into the code base; Joomla! will be better optimised for running on Microsoft’s IIS, while it will also be delivered through the Web Platform Installer. This is not about Free software. It’s about connecting Joomla! to proprietary software, which would have a negative effect. Microsoft also hooks onto Moodle in the form of a plug-in [1, 2, 3] in order to advance its own proprietary software/services and it hooks onto Linux (with Novell’s help [1, 2, 3]) in order to promote Windows and Hyper-V, which are both proprietary. Suffice to say, there was a violation of the GPL in there, but this wasn’t the first such incident, either. Microsoft does not respect software licences [1, 2, 3, 4]. In any event, all that Microsoft ever contributes in terms of code are connectors to Microsoft databases, services, operating system, etc. It doesn’t actually add real function. The XOOPS community was dealt a bad hand last week. The Dutch Court has rejected its suit against former project manager Herko Coomans and allowed Coomans to keep funds totally more than €15,000 held in a fund earmarked for the project. This is hardly the first open source project to come into a bad way when early or original founders split due to disagreements. Gentoo had all manner of drama surrounding founder Daniel Robbins departure and attempted return. CentOS experienced issues with control of its funds and its domain last year. There’s the split from Mambo to Joomla, X.org from XFree86… most of which have their roots in poor governance issues. By selling Windows and IIS, of course. – They may try to buy proprietary licenses on joomla code (perhaps they have secretly gotten access to Mambo or will soon (maybe through proxy)). With such a license, they can extend joomla so that their branded version has special features and doesn’t interoperate well with others’. They prefer license revenues, aka minting money, over real support revenue, which is less efficient. – They may alternatively or simultaneously bad mouth joomla after they have won support contracts and try to upsell to their other products or to their branded (and perhaps extended) joomla. This is very much like what they did to Apache. Look back at the details from Bruce Perens and Groklaw for example. “I would love to hear exactly how the GPL strips the consumer of “all their rights”. Even entertaining the BSD vs. GPL sort of arguments, I’ve never heard such hyperbole. I had saw this nonsense headline, too, and I had thought about writing about it, but unfortunately it was in passing, as I was in the middle of other things at that moment, and I forgot about it. I am glad to hear it did get covered though. Here is a very recent example of GPL hostility/allergy (Microsoft Word). I keep getting an error when I try to post to the joomla community page for that story. Microsoft has credibility problems as an open source vendor. They already tried very hard for many years to insult and lie about open source before their customers and developer community. They need credibility to win contracts that would otherwise go to other companies (eg, that are smaller, that support foss, that are not monopolists, etc). They need contracts to get their proprietary monopolistic software into place to displace the encroachment by Linux and other open platforms. Microsoft’ market controls are seated with their monopolies over platforms (made possible through trade-secret interop-failing closed-source wares). They need contracts in order to push their wares in and gain confidence of people that currently think, eg, joomla is better than MSware. They will fork Joomla when it behooves them (today is not the day, just like attacking for dotnet patents is for the future, just like vfat patent attacks happened when support was widespread, just like Microsoft applications competitors had their software fail and fall behind just as Microsoft was taking out their ready product with high integration). Joomla and open source can never compete against Microsoft closed source extensions and integration on Windows. Never. Microsoft will set Windows as the game, but this just helps them because in the end you can only possibly win on Linux and you would have helped kill/marginalize/displace/hold back Linux replacing Windows. Note, that Microsoft doesn’t compete fairly. They are in the applications business but have exclusive access to the platform’s source code. That is how they play their “games”. It’s about dominating everything possible as thoroughly as possible so that they make as much money as possible and have as much of a safety net as possible over any current or future competitive threat. They can get access to Mambo code for a proprietary license. Maybe Mambo has already agreed or will be bought out by proxy. Microsoft would then need Joomla code access as well. At that point, they can extend their fork of Joomla as a closed source product integrated into the new versions of Windows/IIS, and this will not interoperate with Joomla vanilla or with any other vendor’s Joomla. People, they repeat the same recipe over and over! and over and over. They embrace and get people to tie themselves to supporting their opaque shifty platform so as to make other platforms appear stale in comparison. Then later, they pick off the third party application vendors that helped them, as they update their platform in ways only their own application software will be able to leverage well. And bugs will get introduced so that migration will require lots of trial and error testing. The gains of the past will be lost. I also expect Microsoft to use their money to soften people (we are all humans) and talk of a wondrous future in your cards if things go right. FOSS people will reveal things to them, give them more decision-making, and spend time on what matters to them. They will also poach off some people (and others will fight hard to try to make the list). Those that are among the more conniving and able to exploit others will be accepted. Yes, get all FOSS projects to fight each other trying to please Microsoft. This is called competition on the opposite side of the transaction to Microsoft while Microsoft eliminates competition on their side (ie, removes Linux threat). That is a win-win for Microsoft-Microsoft. You want a monopoly on your side and lots of competition on the other side. Supply and demand 101. Remember, they would be doing wrong to their stockholders (and this includes many current and past Microsoft executives and top employees and others working in other companies to benefit Microsoft) if they did anything to weaken their already monopoly position. FOSS cannot beat out closed source that does everything FOSS does and then some.. and FOSS won’t be the one which works best on the de facto (closed source) platform. Even something from a proprietary third party who is willing to pay Microsoft lots of money will work better than a community open source project.. when push comes to shove. Companies are taking advantage of open source. The main weapon of most companies (or the greatest temptation) is to leverage the very unfair trade secret of closed source. However, of all such companies, Microsoft has the most skill, resources, nearby levers, and lack of ethics (well, to a large degree these are true best I can tell). Small companies have to be fair because of their position. OTOH, monopolists have every incentive to thwart interop down the line. And Microsoft goes way beyond simply leveraging closed source. They play dirty and exploit all loopholes and psychology they can. Oh, and watch them make it easy for their patented stuff to be leveraged from Joomla API. They take out over a thousand patents a year. Since at least the late 90s, they have expressed in confidential emails (eg, Comes exhibit) that patents will be used to neuter open source. Patents are extremely easy traps to fall into when you start off with a base invention that is patented and is specific (eg, core dotnet). I would not be surprised if they *eventually* start adding code with very subtle bugs. Things they can take advantage of to blow up Joomla when running on Windows. They can suggest to customers discovering the problems that Microsoft has this new software that doesn’t have those problems (once they have a worthy competitor ready to be sold in Joomla’s place). At the same time, they will use bug reports to present these technical failures to the Joomla community as an item that customers really need to fix or they will dump Joomla. And of course, they keep Windows and everything else closed source and obfuscated and self-updating so that they will lead you on a chase trying to plug the holes over and over. Put up or shut up, Microsoft: “release all your relevant source code so we can interop well and be on equal terms”. They will shut up or change the topic or have someone else suggest they might do so some day. PS. Reverse engineering a frequently recompiled/changing obfuscated binary that is very large and can violate any expected behavior or best practice (hypothetical example: leveraging code jump tables built into picture or document files at run time). That’s very polite and informative. Have you attempted to find their E-mail address/es? Joomla! can be shown examples of previous projects, including EEE examples such as IronRuby (also a software licence EEE). Microsoft — like other companies — is doing ‘token source’ (for PR purposes), pretending that Mono/Micro makes .NET ‘kind of like’ source source and Moonlight makes Silver Lie ‘kind of like’ open source. It’s all marketing. When I first read this article, I thought there could be some merit to Microsoft “extending” functionality to Joomla, in the sense that people may be introduced to free software that otherwise would not know existed. This is my experience with openoffice; I first used it in a closed source windows environment before switching to GNU/Linux (Ubuntu). This is a reality for most people who are forced to use proprietary software at work. 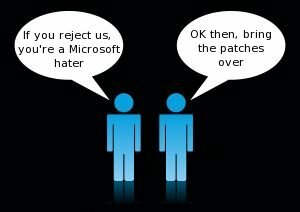 But, after reading Jose_X’s comments it seems more like Microsoft is in stage 2 of their “Embrace, extend, extinguish” business mantra. It is entirely resonable to hold proprietary software companies to the same open standards (that is, to open up their code) as open source companies are held accountable. Perhaps a better standard is to meet the GPL3 licence before being allowed to contribute code. Perhaps? This is one of the reasons the GPL v3 had to be drafted, some might argue a primary one. It is also a reason why all new and many old packages of my own have migrated to GPL v3.